Pileni (also called Reef) is spoken in the Reef Islands of the Solomon Islands Diocese of Temotu in the Church of the Province of Melanesia. Ethnologue identifies just over a thousand speakers as of 1999. A account nearly contemporary to this book of Anglican missionary activity in the Reef Islands is available online: Santa Cruz and the Reef Islands (1908). Pileni's significance derives in part from its being a Polynesian language spoken on Melanesian islands; linguists refer to it as a Samoic Outlier language. It is also important for being spoken on Nukapu (formerly known as Santa Cruz) the island on which the first missionary bishop of Melanesia, John Coleridge Patteson (1827-1871), was martyred. 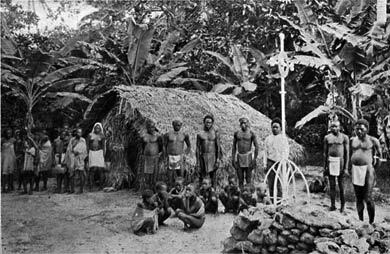 A memorial cross (pictured at left) was erected on Nukapu in Patteson's name, and after his death almost all of the inhabitants of surrounding Pileni-speaking islands became Anglicans. This booklet, which contains only Morning & Evening Prayer, the Litany, and some additional prayers, was published in 1918, and so is a translation of the 1662 BCP. The spelling appears to be inconsistent in a number of places, with words in identical prayers being sometimes spelled differently. This book appears as 140:1 in David Griffiths' Bibliography of the Book of Common Prayer. Thanks are due to Richard Mammana, who provided a copy of the book and transcribed the text.